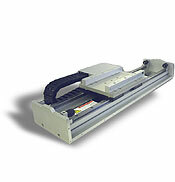 The Sigma Trac linear motor table is a pre-engineered, easily mounted, plug-and-play, ready-to-run package. The linear motor magnet track is mounted to the machined aluminum base and the motor coil is mounted to the moveable carriage. The only contact between the carriage and the base is through caged ball linear guide support bearings. With peak force ranges from 86 to 1200 N and stroke ranges from 100mm to 2 m (other strokes available), the modular Sigma Trac Series slides are ideal for a wide range of precision positioning and general automation applications.